There are countless tuners in Europe and in the United States who specialize in making minor aesthetic modifications to high-end cars. Based in Germany, Ruf stands out from the pack by designing and building a large catalog of parts in-house in order to make Porsches lighter and faster. Ruf’s upgrades are so comprehensive that the company is considered a full-fledged automaker in its home country. A car that perfectly displays the full scope of Ruf’s engineering might is the CTR. The initials stand for Group C Turbo Ruf but the coupe was affectionately nicknamed Yellow Bird by a Road & Track photographer. With the CTR, Ruf set out to build a highly-modified 911 that offered race car-like levels of performance in a street legal, wolf-in-sheep’s-clothing package. Starting with a stock Carrera 3.2, Ruf fitted fiberglass bumpers on both ends and replaced the doors as well as both decklids with aluminum components in order to shed weight. All told, the CTR weighed about 440 pounds less than the Carrera 3.2 on which it was based. Ruf lowered the 911’s drag coefficient by shaving off the rain gutters that ran down both sides of the car and fitting it with mirrors sourced from the 935 race car. Early CTRs wore NACA ducts over the rear haunches but they were quickly removed when tests showed they didn’t work as planned. 17-inch five-spoke wheels manufactured by Speedline and wrapped by low-profile Dunlop tires added a sporty touch to the discreet look. The track-ready treatment continued inside with a padded roll cage and a pair of Recaro bucket seats. Although Ruf wanted to equip the CTR with turbochargers in order to obtain as much power as possible, it chose to start with the Carrera’s naturally-aspirated 3.2-liter flat-six instead of using the 930’s turbocharged 3.4-liter six. The 930’s engine was an excellent unit but the 3.2-liter was considered the ideal starting point because it was lighter and it offered better weight distribution. Ruf increased the six’s displacement to 3.4-liters by boring out the cylinders to 98 millimeters, and it upgraded the mill with a DME fuel-injection system that was derived from the one used in the 962 race car. 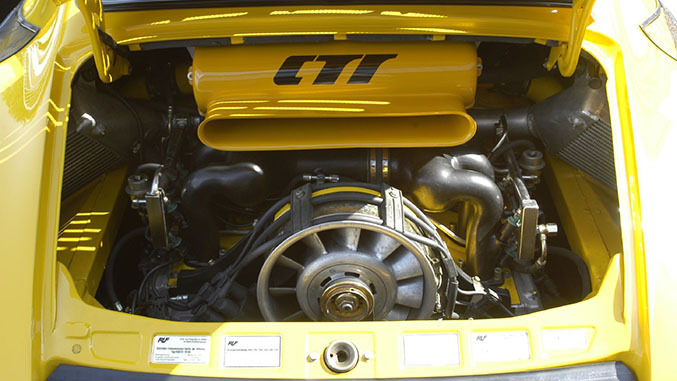 Finally, two beefy KKK turbochargers cooled by dual intercoolers were squeezed into the 911’s engine bay, making it necessary to relocate the oil filler under a flap located on the passenger side of the car. The extensive modifications bumped the flat-six’s output to 469 horsepower at 5,950 rpms and 408 lb-ft. of torque at 5,100 rpms. The prodigious amount of power allowed the 2,579-pound CTR to hit 60 mph from a stop in 3.7 seconds, a jaw-dropping statistic in the late-1980s. The CTR went on to hit 100 mph in 7.8 seconds before topping out at 211 mph. The ‘Ring lap made the CTR famous in Germany but it became a truly global legend when Road & Track called it “the fastest car in the world” in its July, 1987, issue. The CTR beat well-established supercars like the Lamborghini Countach 5000S, the Ferrari Testarossa, the AMG Hammer and even Porsche’s own 959 in a supercar shoot-out held on Volkswagen’s proving grounds in Ehra-Lessien, Germany. The CTR was one of just two cars that managed to go beyond the 200-mph mark. Factory records indicate Ruf built a total of 29 examples of the Yellow Bird from scratch starting in 1987. 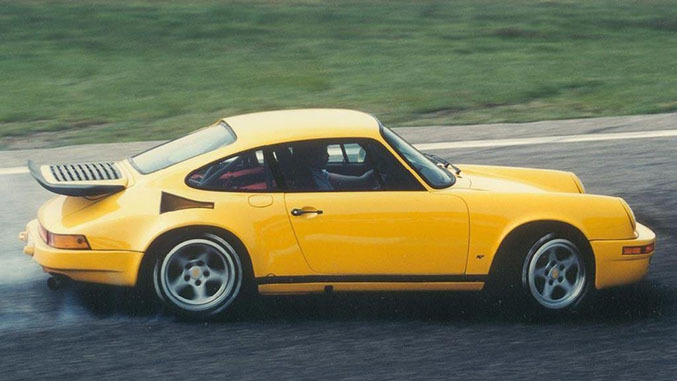 In the late-1980s it cost $223,000 to buy a brand new CTR straight from Ruf, or a little less to ship a Carrera 3.2 to the company’s skunkworks and have it converted to Yellow Bird specification.